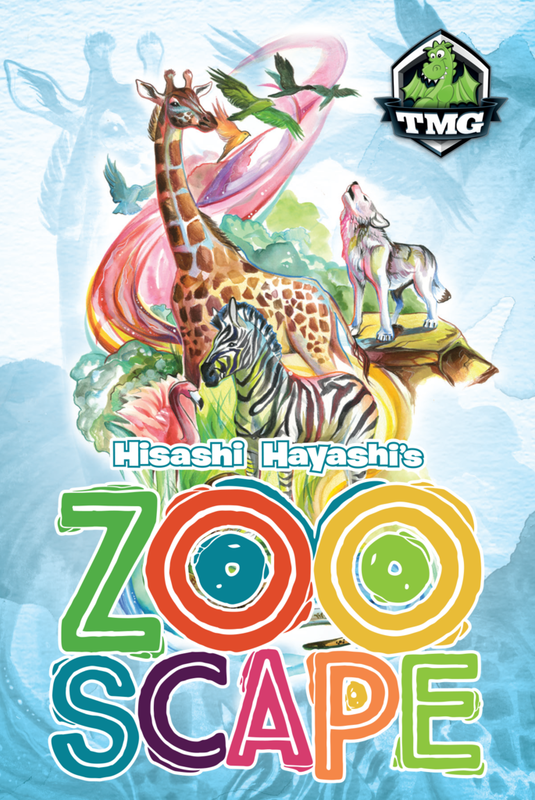 ZooScape is a game by Hisashi Hayashi, published by Tasty Minstrel Games. It is for 3-6 players. In this game, players take on the role of zookeepers as they chase down escaped animals. They’ll be trying to round up the most points worth of animals and place them back in their cages without overcrowding them. In the end, the player that can prove they’re the best zookeeper will be declared the winner. To begin, the Zoo cards are shuffled together. Cards from the Zoo deck are then dealt out to form 5 face down decks. The number of cards that are dealt out to each deck is based on the number of players. In a 4 player game, 10 cards are dealt to each deck. Any remaining cards are returned to the box. The Fish cards are placed in a stack in the center of the play area. Each player is given one First and one Second Zookeeper card. The first player is chosen and they are given the Zoo Manager, Clipboard and Zoo Gate cards. Play now begins. The game is played over a series of 5 rounds. Each round is divided into 3 phases; splitting the cards, chasing animals and cleanup. The first phase is splitting the cards. In this phase, the Zoo Manager deals out all of the cards from the first of the 5 decks. Each card is dealt out face up into a single line in the middle of the play area. The line is created in the same order as the cards were dealt out. The order can not be changed. The Zoo Manager then splits the line into two groups by sliding the cards over and placing the Zoo Gate between the two groups. It should be noted that each group must have at least 1 card in it. The Zoo Manager then places the Clipboard card into one of the two groups at any point in the line. The second phase is the chasing animals phase. In this phase, each player will use their Zookeeper card to secretly show which group of cards they would like to have. Each player will take one of their Zookeeper cards and hold it face down in front of themself. They will choose either their first Zookeeper card if they want the cards on the left of the gate, or the second Zookeeper card if they want the cards on the right. Once everyone is ready, the cards are revealed. If a single player is the only one to select one of the groups, that player will then take all of the cards in that group ending their participation in that round. If there were no players to select one of the groups, the cards in that group are placed under the Clipboard card. If more than one player selected the same group, then the group will need to be split again. The Zoo Manager hands the Zoo Manager card to the next player in turn order. If they received the Clipboard card, they will also hand it to the same player along with any cards that were under it. The new Zoo Manager will now split the group into two groups, following the same steps as described earlier. If they were given the Clipboard card, it is placed in the line as well. Like before, any players that haven’t received any cards will secretly select a group using the same technique. This continues until either all players have received a group of cards or the cards can’t be split into two groups of at least 1 card each. In this case, each player that did not receive any cards now receives a Fish card as a consolation prize. It should be noted that when a player receives cards, they are placed face up in front of them in individual groups. Some cards are animal cards and will provide points as long as the cage limit isn’t exceeded. In that case they will score negative points at the end of the game. Hunters also provide negative points. Veterinarians force a player to discard 2 of their animal cards. Wild Animals cause the player to draw a random card from the unused cards in the box adding it to their face up cards. Chameleons become a copy of whichever animal the player has the most of. Once everything has been placed and dealt with, the next phase begins. The final phase is the cleanup phase. In this phase, the player that has the Clipboard will now receive all the cards that were placed under it from earlier. If there were no cards underneath the Clipboard card, the player receives a Fish card. They also receive the Zoo Manager card making them the Zoo Manager for the next round. If no other player received the Clipboard card, the cards beneath it remain there for the next round and the Zoo Manager card is passed to the next player in turn order, along with the Clipboard card and any cards beneath it. A new round now begins. The game continues until 5 rounds have been played, using all 5 decks. Players add up their points and the player with the most points is the winner. There are some really beautiful looking cards included with this game. 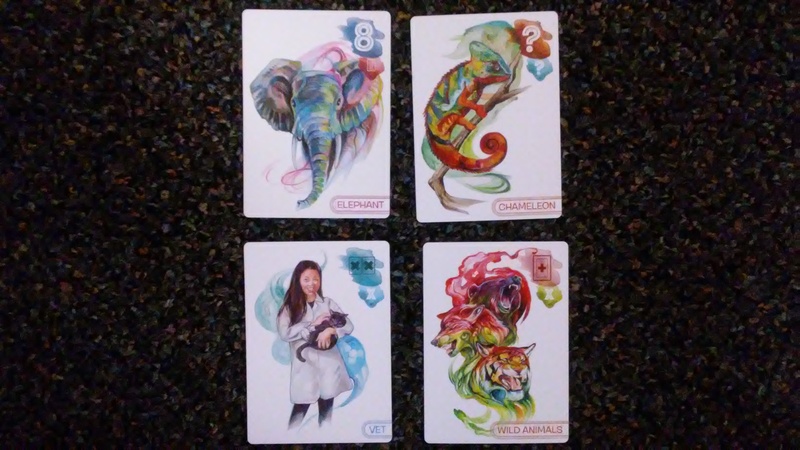 The game comes with 74 Zoo cards which include all the different animals and the Veterinarians. There are also 10 Fish cards and 12 Zookeeper cards, as well as the Zoo Manager, Clipboard and Zoo Gate cards. These look amazing. I love the artistic look of each one. The huge splashes of color highlighting the head of each animal is absolutely gorgeous while the varied people on the cards look like a painting. I especially like all the different animals. I only wish that there had been a bit more variety. As it is there are no great apes like gorillas or orangutans. Neither are there any pandas or koalas. That’s a bit of a disappointment as my family loves them. The cards have a great linen style finish to them which keeps them from sticking together or causing problems while shuffling. I have to say that overall I’m really thrilled with how nice the cards look. I don’t think that most people will have any problem with the overall look and feel of these cards. The rulebook for this game is a huge double sided paper that folds up small enough to fit inside the box. It’s made of thicker material than just your average copy paper. It has some great looking pictures on it, some of which are examples of how the game is played. Every aspect of the game is covered quite well. All the different card types are explained in detail as well. The rules are easy to read and won’t take a long time either. Overall I think that the rules do a good job of conveying what you need to know to play the game in a quick and concise way. I have nothing to really complain about here. This is a quick and fun game that is very simple to play. It’s easy enough that even younger players can play fairly easily. The few card icons aren’t that difficult to remember and shouldn’t pose a problem for most players. At it’s heart, it is merely a game of set collection. However it does help if you’re able to read your opponents by looking at what they already have in their zoo and then determining which group of cards they will go for. It helps you to be able to get the most cards at a time if you can do this just right. Although you will find that sometimes, what you want is in the group that you think they’ll go for too. So do you go for it and risk taking less cards if they also pick that group or do you go for what you think is the safe bet and go for the group you think they won’t take. Another thing you have to be aware of is not overloading your cages. Animals like the lions can only have 2 in their cage. If you wind up with 3 of them, well that’s a negative 3 points that you’ll wind up with at the end of the game unless you can get rid of one of them with a Veterinarian card. Overall I like the light fast gameplay of this one and find it to be a great little filler game. I think that fans of set collection games should enjoy this one, especially if they like a little luck thrown in for seasoning. Overall this is a nice little family card game that most players should enjoy. i would recommend it. ZooScape is a light weight card game of collecting animals that’s fun for the whole family. It’s not a very long game. Most game sessions can be played in around 20 minutes. The artwork on the cards is really beautiful. I love the artistic designs. However I do wish there had been a bit more animal types in the cards. I think that this is a great game for families. It’s simple enough that even younger players can play fairly easily. The few card icons shouldn’t be a real problem. I think that it’s light enough and fast enough that it makes a great filler game. It’s small enough that it’s pretty portable and can be played almost anywhere. I think that fans of set collection games should really enjoy this one, especially if they like a little bit of luck thrown in. Overall I rather enjoy the game and think it’s good fun for the whole family. I would recommend it. Now get out there and catch those animals. This entry was posted in Reviews and tagged board, board games, card, card games, games, hayashi, hisashi, Hisashi Hayashi, minstrel, tasty, tasty minstrel, tasty minstrel games, zoo, zooscape. Bookmark the permalink.